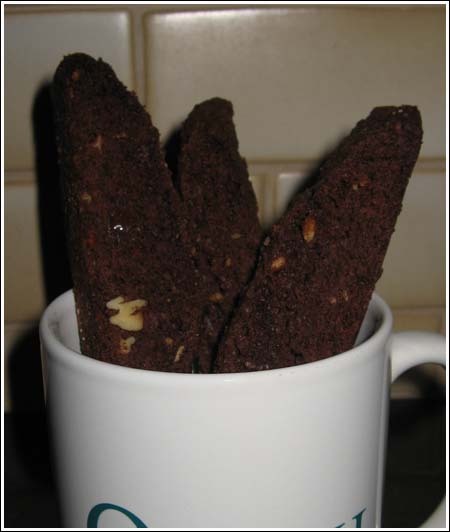 Mexican Chocolate Biscotti is a spin-off of the biscotti on my Top 10 list. That is, Gourmet Magazine’s biscotti. It’s a great recipe, but I decided to give it a Mexican theme and added espresso powder, Mexican vanilla, pecans and cinnamon. Hershey’s cinnamon chips would be awesome here……but I didn’t have any. Preheat oven to 350°F. Line a cookie sheet with parchment or spray with cooking spray. In a bowl whisk together flour, cocoa powder, baking soda, salt and espresso powder. In another bowl with an electric mixer beat together butter and granulated sugar until light and fluffy. Add vanilla and eggs; beat until combined. Stir in flour mixture to form a stiff dough. Stir in walnuts and chocolate chips. Wet hands and form dough into two slightly flattened logs, each 12 inches long and 2 inches wide. I do this directly on the baking sheet. Sprinkle cinnamon sugar mixture over logs, coating them evenly. Bake logs 35 minutes, or until slightly firm to the touch. Cool on baking sheet 5 minutes. Jen, I liked them a bit better but mainly because I’ve been on a chocolate-cinnamon kick. Did you like these better than the originals? The original is my favorite biscotti, too. O.K. these are tagged! These will be on my Christmas cookie plate. Thank you. Tammy if you can’t find espresso powder at your grocery store it is available on line. Just google espresso powder. King Arthur Flour has a very good espresso powder. Usually, espresso powder is in the regular coffee aisle. It’s sold under the brand name Medaglio D’oro and it comes in a little glass jar with the green and red on it. Since you can’t find it, you might want to just substitute Folgers crystals or some other instant coffee. Espresso powder is a little stronger, so in the case of this recipe, I’d use double the amount of crystals. Instant coffee crystals have kind of a different flavor than espresso powder, but it’s not bad. I’m not sure if coffee grinds would dissolve properly. I love your blog; your recipes are always terrific. I need help with this one, though. I can’t find espresso powder anywhere. All I get is blank stares when I ask at the grocery stores around here. And to be honest, I don’t really know what it is when they ask me. I have found espresso coffee grinds, though. Can that be used? If not, where should I look for espresso powder or what could I substitute? Thanks for your help.